Sergei Tretyakov: "In Memory of Mutual Service"
2009 will mark the 175th anniversary of the birth of Sergei Mikhailovich Tretyakov. He was born on January 19 1834 (January 31, by the old calendar), the second child in a Zamoskvorechye District merchant’s family. Sergei Tretyakov was the younger brother of the founder of the Russian National Art Gallery, Pavel Mikhailovich Tretyakov. He was his elder brother’s close friend, a reliable partner, and assistant. Sergei Tretyakov was widely known in Moscow as a public figure and art collector. His fine, noble face is captured in photographic portraits, many of which are kept in the department of manuscripts of the Tretyakov Gallery. There is a wonderful photographic portrait in the manuscripts department, with the hand-written dedication: “To Count Vladimir Mikhailovich Golitsyn. In memory of mutual service to the care of sick and wounded soldiers in the city hospitals. With deep gratitude, Sergei Tretyakov. November 1878.” The slight turn of the head, friendly slim face with a high forehead and attentive open gaze — notwithstanding the balding head and graying hair and the moustache and beard, the image of the man is fairly youthful. His hands are not visible; we can just guess his slender figure from the silhouette. This cabinet photograph was made by Ivan Grigorievich Dyagovchenko (1835-1887), who began working in Moscow in April 1867. His studio on Bolshaya Lubyanka Street, 55/62 (in the house of Count Golitsyn) was very popular. For his artistry, this outstanding photographer was many times awarded gold and silver medals at exhibitions. He sold his studio in 1876, but in July of that same year he opened a new one in the house of the Bishop of Tver’s church in town, on Kuznetsky Most, 66. As before, writers, artists and public figures visited Dyagovchenko’s studio, and many of the visitors were his friends. Pavel Tretyakov came to the photographer many times, too. 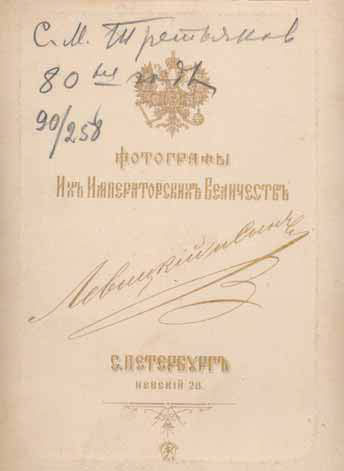 If it were not for the Dyagovchenko’s signature stamp with several medals and the address: “Kuznetsky Most”, one might say that Sergei Tretyakov is just over 40 years old in this photograph. The time when this portrait was created should be considered no earlier than 1876 and no later than November 1878. Tretyakov was elected Mayor of Moscow in January 1877. When the last Russo-Turkish war started in spring 1877, Tretyakov and Count Golitsyn began their “mutual service”. Golitsyn was then a special-task official of the Moscow governor-general, and he simultaneously served as a town-councilor. 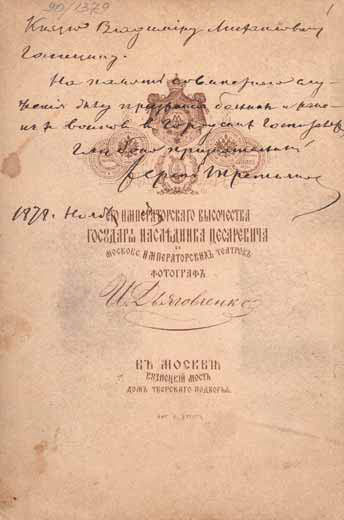 Under Sergei Tretyakov’s leadership, the Moscow Duma gave one million rubles to open a number of hospitals. 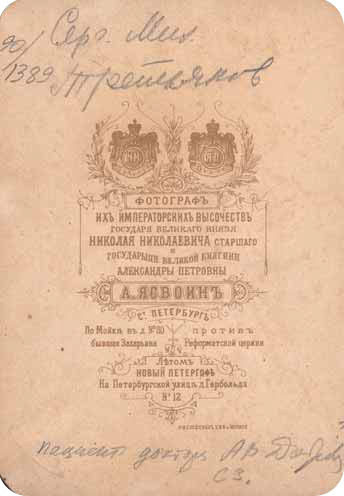 Tretyakov as Mayor of Moscow also supported the initiative of a banker and patron of arts Nikolai Naidenov to issue a series of albums with photos of Moscow. the authors date the photographs of the family members in different ways. (These photographs are preserved in the Tretyakov Gallery.) There are also inconsistencies in the inventories of the museum manuscripts departments. Today it is possible to amend and clarify some of the dating, and also to adduce which photo studio Sergei Tretyakov preferred. 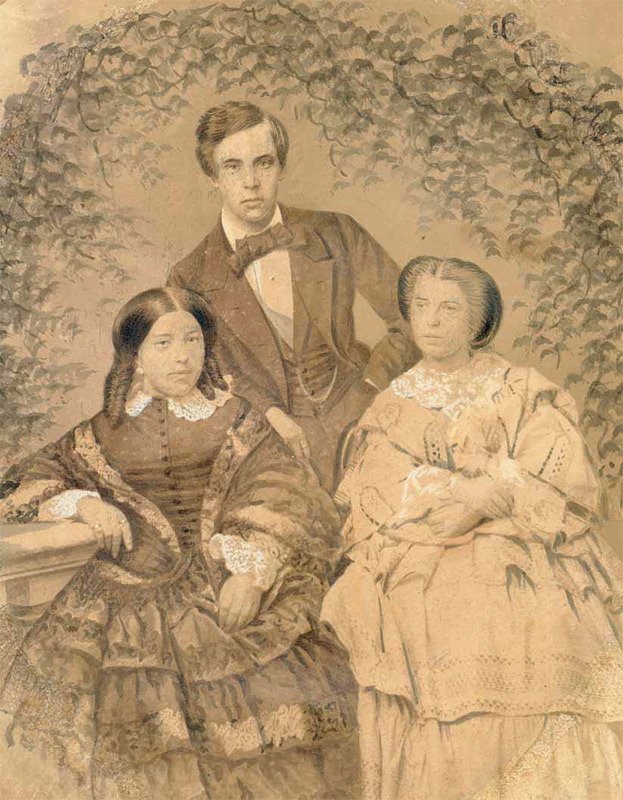 The earliest is an extremely rare photographic portrait, where Sergei Tretyakov is pictured with his wife Elizaveta Sergeevna (born Mazurina), and her older sister Anna Sergeevna Alekseeva. A composite photograph, “salty paper” colorized in watercolour and retouched — these are the special characteristics of the photographic process of the 1850s. According to the composition, this is a romanticized portrait in full dress. The ladies are sitting in the foreground, while Sergei Mikhailovich is standing, casually leaning on the back of the chair of his young wife. They are both wearing wedding rings on their index fingers, according to the old Russian custom (they were married in the autumn of 1856). The photograph has preserved for us the image of the young Sergei Tretyakov: without a hint of any facial hair, with a wide forehead and thick wavy hair, parted on the side. He is dressed in the fashion of the 1850s: the shirtfront, the double wide flat bow tie, and the vest with the golden pocket-watch chain add to the image of a brilliant young man of a newly-emerging Russian bourgeois society. By the time this portrait was created he was an honorary citizen of the merchant class (Alexandra Danilovna Tretyakova and her children were awarded this title in 1856). The sisters’ elegant dresses are overloaded with detail: they have basque bodices, wide skirts with flounces and frills, double sleeves, lace collars and cuffs, embroidery and lacing detail. The photograph has preserved for history the young Elizaveta Sergeevna’s thoughtful look, her smooth English coiffure, with low long curls on the sides. She is petite, “not a beauty”, but a smart girl, the way she is described in a letter of Timofei Zhegin, a friend and companion of the Tretyakovs. 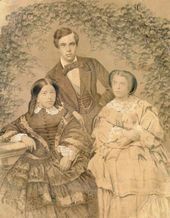 The unique family portrait may be dated to the second half of the 1850s. 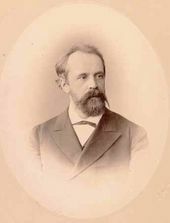 Sergei Mikhailovich’s happiness did not last long, however: his son Nikolai was born in 1857, but in 1860 his beloved wife died. A well-known visiting-card photograph of Sergei Tretyakov shows him sitting in an armchair by a table. The light falls from the left and glides along the still figure, bringing the tired face into focus. This work is by an outstanding master of psychological portraiture, Sergei Lvovich Levitsky (1819-1898). He was interested in galvanoplastics and daguerreotype and served as an attorney in the Ministry of Internal Affairs in St. Petersburg. 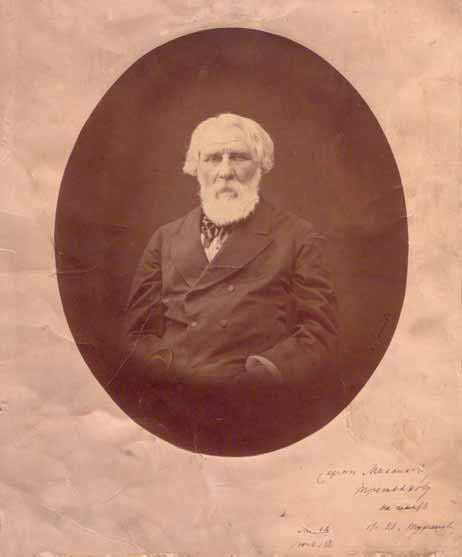 Having retired he opened a daguerreotype atelier in the northern capital in 1849-1850. Levitsky retired in 1844 and left for Paris, where he perfected his skills in daguerreotype. In 1849-1850 he opened a daguerreotype studio in the northern capital. In 1851, at an exhibition in Paris, Levitsky received a gold medal, the first one to be awarded for photographic work, and in 1859 he opened his own photography studio in Paris. During his time in Paris, Levitsky invented the negative retouch, and during the same time he received the title of “the photographer of Emperor Napoleon the Third”. The artist returned to St. Petersburg in 1865. 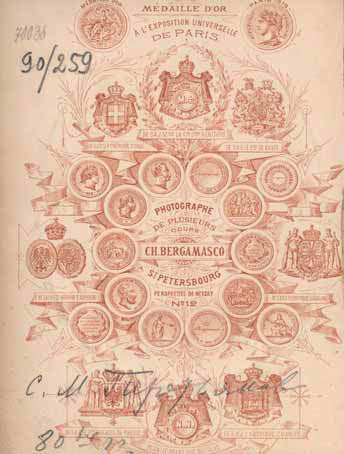 He received the highest awards many times during his lifetime, and more than once he changed his signature stamps on the studio’s mounting board. This portrait bears the almost inconspicuous stamp: “Levitsky, 22, Rue de Chisel”. It undoubtedly belongs to the Parisian period of the photographer’s work. 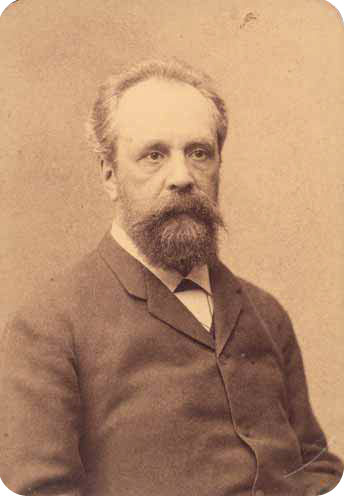 Sergei Tretyakov frequently lived in Paris as an overseas representative of the trade firm “Brothers P and S. Tretyakov and V. Konshin”. 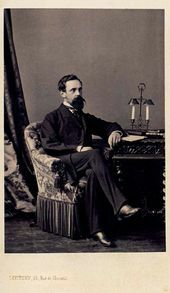 There is another portrait made by the photographer and artist Alexander Fedorovich Eichenwald, who opened his studio in Moscow, on 12 Petrovka Street, in the summer of 1867. A serious young man who is a little over 30 is depicted in the photograph. By the time it was taken, Sergei Mikhailovich was the foreman of the merchants and town-councilor. A close friend of the brothers Rubenstein since childhood, he became one of the founders and directors of the Moscow department of the Russian Musical Society. There were changes in his private life as well: in November 1868, Sergei Tretyakov married Elena Andreevna Matveeva. “My happiness is so full,” he wrote to his brother. Taking into consideration the natural youthfulness of the man in the portrait, and the signature stamp of the photographer, one may assume that this photograph appeared precisely in time for this important event. The oval portrait with embossed impression is unquestionably one of the best. 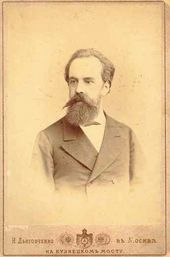 Its author, Karl Ivanovich Bergamasko (1830-1896) — an actor, artist, daguerreotypist, and photographer, worked at 12 Nevsky Prospekt from the early 1850s. A brilliant master, Bergamasko received the highest Russian and foreign awards many times. He was awarded the title of the Court Photographer for many high ranking nobles, including representatives of the imperial court. His photographs bear different signature stamps, depending on the time of their creation. The medals on the portrait of Sergei Mikhailovich Tretyakov are characteristic of the 1880s. While comparing this work to the photograph by Dyagovchenko, we see that the person depicted does not differ much in age — he has the same inquisitive glance, and a friendly noble face. He has just acquired a dignified stateliness in his figure, which had grown slightly more plump. 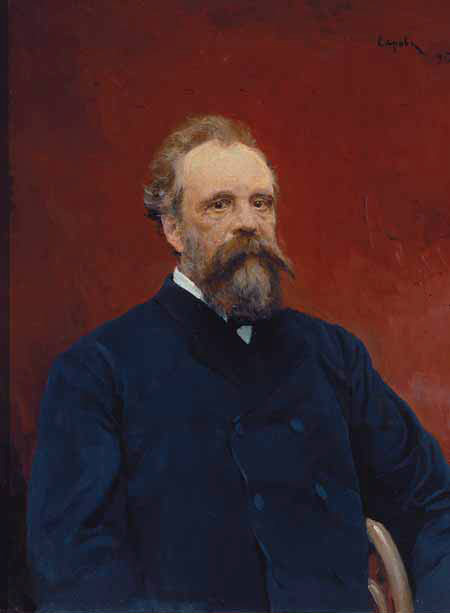 The portrait was most likely made by Bergamasko during Tretyakov’s public service as Mayor of Moscow. It is possible that it was made after the unveiling of the statue of Pushkin in Moscow on May 26 1880, where Sergei Tretyakov gave a speech. As an organizer of the event, Tretyakov took care of its financing. 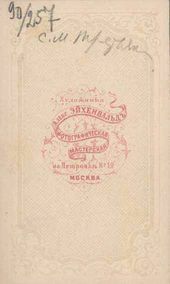 Many writers spoke at this jubilee — Fyodor Dostoevsky gave his famous speech and afterward reconciled with Ivan Turgenev. In the collection of the manuscripts department of the Tretyakov Gallery there is a photographic portrait of the latter writer who was loved by the whole Tretyakov family with the inscription: “To Sergei Mikhailovich Tretyakov from Iv. Turgenev, in memory. Moscow. June 1881.” Ivan Sergeevich visited the house of the hospitable art patron many times. It is possible that they met each other still earlier in Paris. and Son”. 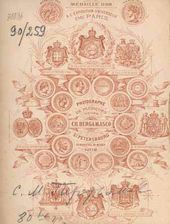 The photograph bears this particular signature stamp. Most likely, it may be dated late 1881, when, because of intrigues, Sergei Tretyakov was forced to leave his position as mayor. His family life did not work out as well. 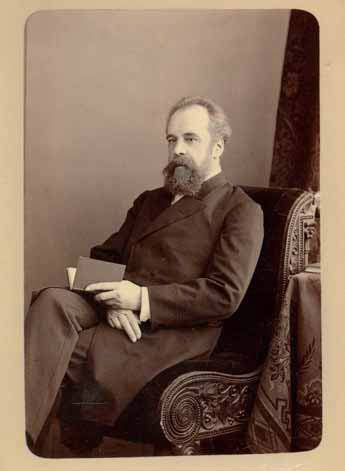 Vera Nikolaevna Tretyakova, the wife of Pavel Mikhailovich, wrote: “It is a shame that Seryozha’s life turned out so sad; he is always alone at home.” While comparing this portrait with the works by Bergamasko, it is evident that Sergei Mikhailovich is older, even if not by much. It is strange, but there is a palpable philosophical isolation and loneliness in his image. Recently, one more rare photograph of Sergei Tretyakov came to the manuscripts department of the Tretyakov Gallery. The photograph originated from the family of a well-known Moscow doctor Alexei Vasilievich Dobrov (18311896), the doctor of the Arnold school for the deaf, the chief doctor of the Alexander hospital of the Moscow merchant society. Somebody wrote in pencil on the back of the photograph: “A.V. Dobrov’s patient?” Most likely, they were colleagues. 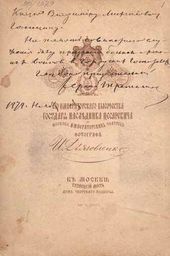 Dobrov had been a doctor since 1866 at the Solodovnikov alms-house, and the younger Tretyakov brother was a trustee of that institution and a member of the Board of the Alexander Hospital since 1876. Sergei Mikhailovich looks somewhat weary and sickly in this photograph. His gaze is detached, his face puffy, with wrinkles and bags under his eyes. The photograph is very reminiscent of his posthumous portrait by Valentin Serov (1895, in the Tretyakov Gallery), which was painted, as we know, from a photograph, and was ordered by the Moscow City Duma. The difference between the portraits lies only in the fact that in the painting Sergei Mikhailovich’s gaze is directed towards the viewer. The photograph is not dated. It was tempting to refer it to the late 1880s-early 1890s, but thanks to the information that I received from the well-known specialist on the history of photography, Tatiana Shipova (to whom I am extremely grateful), it became clear that this portrait was created in May 1883 at the latest, which means almost ten years before Sergei Tretyakov’s death. 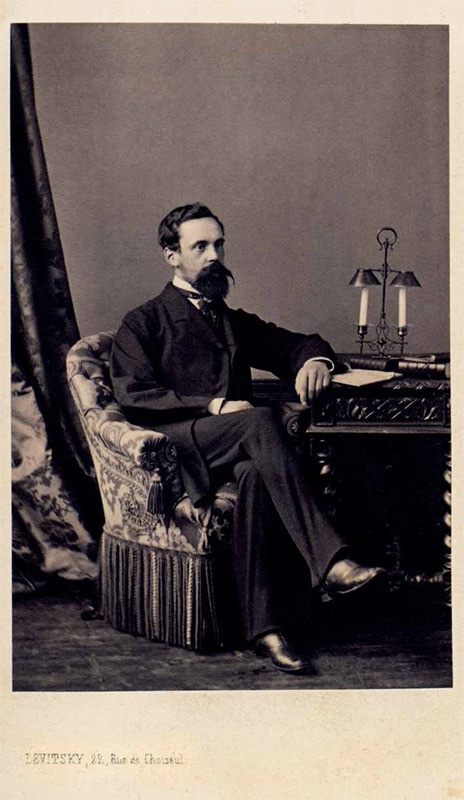 The cabinet photograph was made by Abram Ilyich Yasvoin (?-1883). 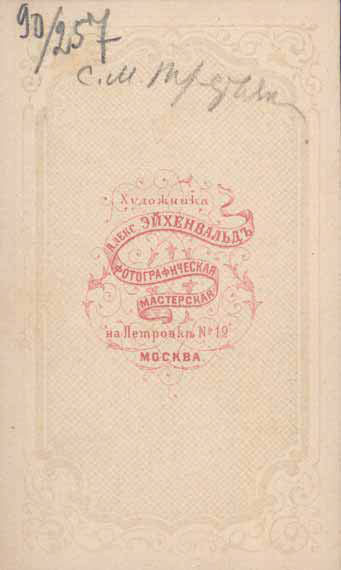 In 1874 he opened a photo studio in St. Petersburg at “Moika, house number 80”. In 1878 for his mastery he was awarded the title of “Photographer of Their Imperial Majesties Grand Duke Nikolai Nikolaevich senior and Her Majesty Grand Duchess Alexandra Petrovna”. 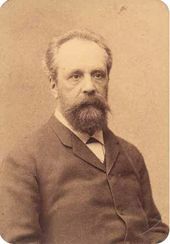 He died in May 1883. Rosa Ventseslavovna Yasvoin continued her husband’s business under her own name. 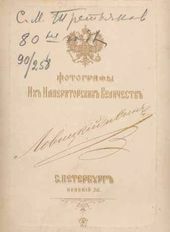 It is interesting that the photographer’s signature stamp in the lower right corner bears the initials of Ernst Ivanovich Gleitsman, the supplier of Bristol cardboard for Moscow and St. Petersburg. 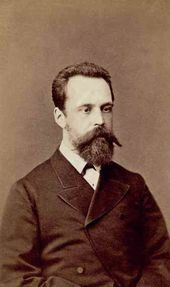 Sergei Tretyakov died in the summer of 1892. According to his will, his collection of Russian and foreign art, including artworks of such renowned painters as Corot, Daubigny, Bastien-Lepage, joined his brother’s collection. Pavel Mikhailovich, carrying out his brother’s will, presented his collection along with his huge gallery of national art to Moscow. As an act of gratitude and respect, the Pavel and Sergei Tretyakov City Art Gallery dedicated two memorial halls to Sergei Mikhailovich, where the part of the Western collection, tapestries and the personal office were located. 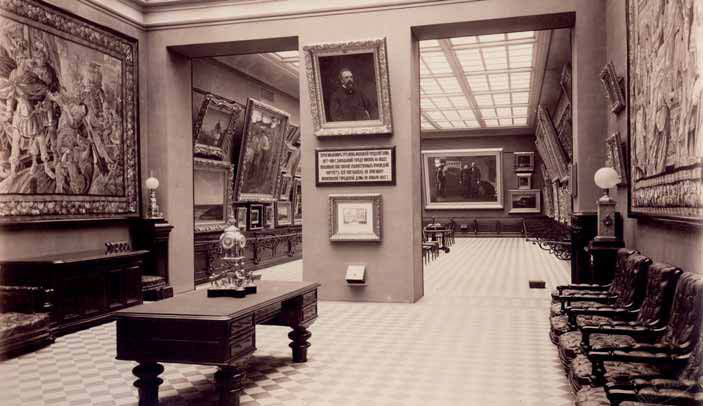 The overview of Sergei Tretyakov’s portraits from the manuscripts department of the Tretyakov Gallery would not be complete without mentioning the photographs of the memorial halls made by “Sherer, Nabgolts &Co” in 1898. In one of the photographs we may see the posthumous image of Sergei Tretyakov by Valentin Serov. To this day, the personal archive of Sergei Mikhailovich has not been found — it was probably destroyed in the first half of the 20th Century. 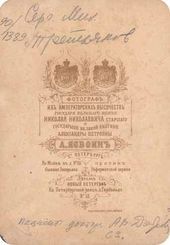 The manuscripts department of the Tretyakov Gallery is perhaps the major owner of a modest collection of his letters, documents and unique photographs, created by the best masters of the 19th century photography with the help of then-fashionable “photographic machines”. Botkina A.P. P.M. Tretyakov in life and art. Moscow, 1995. The portrait was made by the artist and photographer Mikhail Panov (1836-1894), a friend of Ivan Kramskoy. Founded in 1860 by Martin Sherer (?-1883) and Georgy Nabgolts (?-1883). In 1868 the company was held on lease and then bought by Albert Mei and M. Shindler, preserving the former name of the company “Sherer, Nabgolts &Co"